Sea Salt Caramel Corn: An addictive combination of sweet caramel with just a hint of saltiness baked right into crunchy popcorn. Delish! Do you crave salty snacks or do you crave sweet snacks? Me? It’s usually salty and one of my all-time favorite snack foods is popcorn. As a kid I loved making it in an air popper. What a great Christmas gift that was! And, of course, in the pre-microwave days, we made it on the stove in a big pot. Well, life has come full-circle because last year, I started popping my popcorn on the stove again. And it’s thanks to this recipe for encouraging me to do so! 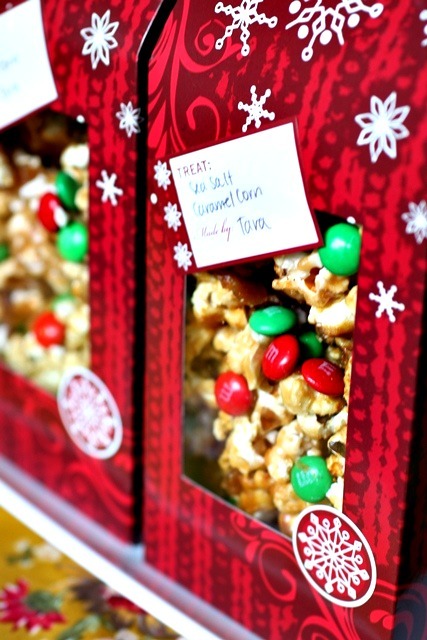 If you love caramel corn as much as I do, you can’t go wrong with this recipe! And if you’re a novice at making homemade caramel like I certainly was last year when I first made this recipe, you’ll have no trouble making it here. It’s so easy! You’ll make your popcorn, whip up some caramel, pour it over the popcorn, toss to coat, and put the popcorn in the oven on a low temperature for almost an hour. The most difficult part about the whole process is waiting for it to cool! This year, I made a double batch and packaged it all up yesterday in my Christmas treat packages. And frankly, it’s better that I don’t have any of this sea salt caramel corn left in the house for myself. Because I can’t keep my hands off of it! Make sure you come back tomorrow for a special Christmas post! If you want to add M&Ms to this caramel corn, mix a couple cups into the cooled popcorn before you serve or package it up. Pop popcorn using your preferred method. Place the popped popcorn in a very large bowl (or two large bowls). Make sure there is enough room in your bowls for tossing the popcorn. Preheat the oven to 250° F. Line 2 large baking sheets with parchment paper. Meanwhile, to make the caramel, melt the butter in a 2-quart saucepan set over medium heat. Once the butter is melted, mix in the corn syrup, brown sugar and salt. Increase the heat to medium-high and bring the mixture to a boil, stirring frequently. Spread the popcorn evenly onto the prepared baking sheets. It is okay if there are some clumps of caramel throughout. It will melt and become better spread out while baking. This looks gorgeous! I bet it tastes better. What a festive treat, and a great gift! Hi, I just found your site, I immediately had to make this, it was soo good and I can barely keep my hands off of it. I will NEVER buy cracker jack again! I hope there’s some left for my kids! 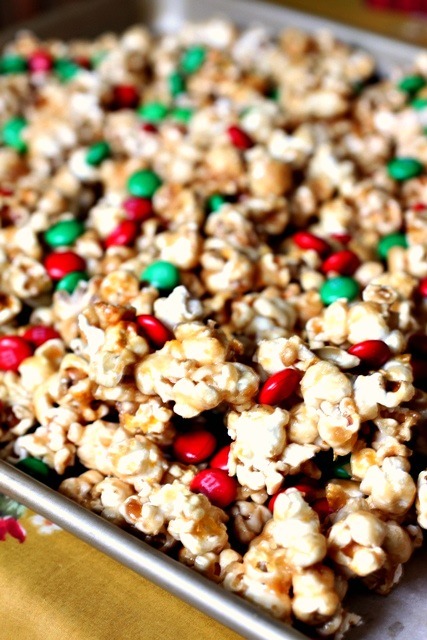 this is soo good i should try this…every thing look delicious..
Great recipe and love the festive M&Ms. How many M&Ms did you add? Did you mix them in before or after baking? Can’t wait to make this! This looks so delicious and festive w/ the red and green M&M’s. I think I’m going to make some this weekend for giving away. Just wondering, did you use course sea salt or fine sea salt? Thank you!!! I’m sorry for taking so long to respond to you! You comment got pushed to my spam folder. 🙁 Anyway, I believe I used fine sea salt – it was the only kind of sea salt I had at the time.